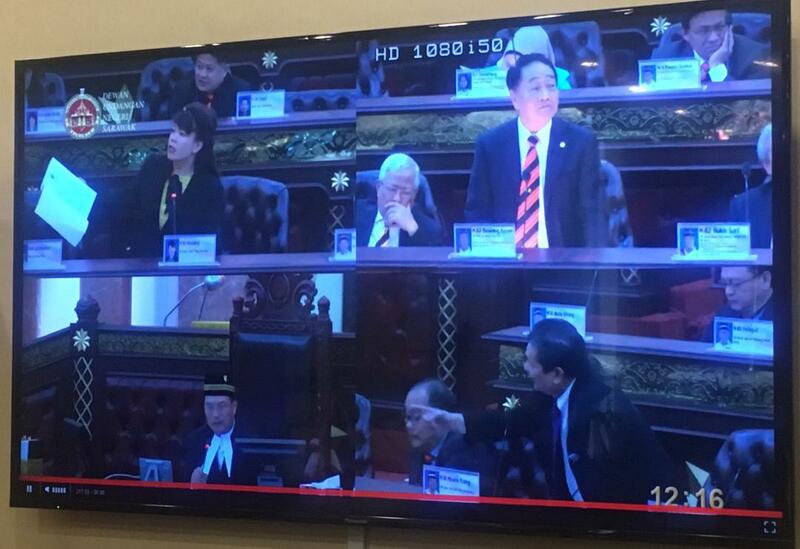 A screen grab of Yong, Wong and Idris during the tabling of the motion. KUCHING: Violet Yong (DAP – Pending) was fined RM2,000 for contempt of the August House after she refused to publicly apologise and delete a Facebook posting that disparaged the State Legislative Assembly and Speaker. The posting in question is a status update made by Yong on her Facebook account at around noon yesterday (Nov 13), alleging that the Sarawak DUN Speaker’s emolument for year 2019 is RM5.947 million. Later that day, she made a another post announcing that she might be facing a motion in DUN for the aforementioned posting. This punishment was meted under Section 24(1) of the Dewan Undangan Negri Power and Privileges Chapter 65 after she was referred to the privileges committee. International Trade and E-Commerce Minister Dato Sri Wong Soon Koh, who moved this in his ministerial motion, had suggested for Yong to be punished with the maximum fine of RM2,000 for showing no remorse to the offence committed. Wong also said the Facebook posting by Yong had gone viral and thousands had been misled by it. He explained the move to punish her was due to the gravity of the offence and the damage she has done to the Speaker’s office. He also mentioned that the fine will be reduced if Yong were to apologise and delete the posting. Yong in her response said she would not do it, and alleged that the move to punish her showed that she just like the rest of the opposition are being oppressed and bullied by the majority in the August House. A total 62 members voted in favour of the motion to punish Yong, while only 8 voted against, after it was put to vote by DUN Deputy Speaker Dato Gerawat Gala. Minister in the Chief Minister’s Office (Integrity and Ombudsman) Datuk Talib Zulpilip seconded the motion by Wong. Dato Idris Buang (PBB – Muara Tuang) rose to support the motion and questioned Yong’s intention for the Facebook posting, while Chong Chieng Jen (DAP – Kota Sentosa) stood up to defend Yong.